The XT-CFv3 DMA transfer mode works in an unconventional way to deliver the highest possible throughput for the original IBM PC and PC/XT – here’s how. What happens next depends on whether more data is available (so DRQ is still asserted), whether the transfer counter has reached zero, and finally the DMA controller operating mode. In single byte transfer mode, the DMA controller will return control to the CPU by releasing HOLD after each byte, whilst in demand mode the process will continue until the IO device releases DRQ (block mode generally isn’t used because it can disrupt RAM refresh, as described below). Freeing up the bus for just the data by the elimination of all the instructions pays significant dividends – this delivers about 390KB/s at 4.77MHz (and is available in the ‘XTplus’ XTIDE Universal BIOS build, for V20/286 powered XT class hardware). In the XT-CFv3, the oDRQ output in the schematic is delivered to the ISA bus via a 3-state output buffer, because the card must be able to co-exist with any original hard disk controller and DMA channels (DRQ/DACK pairs) can’t be shared as there are no pull-ups on the DRQ lines, so the card must drive the line continually when DMA function is in use. The results are heavily dependent on the media: the majority of CompactFlash cards support only single-sector transfers, and therefore the DMA controller must be programmed once for every 512 bytes transferred, which delivers about 420 KB/s – a vast improvement on 8-bit port IO. But for devices supporting multi-sector transfers, performance rises to 530KB/s with an 8088 and a 560KB/s with a V20 (both at 4.77MHz). XT-CFv2 Shelved – What Happened? The lo-tech XT-CF, itself really just a port of the Dangerous Prototypes XTIDEv2 board, worked well but it had become clear that by adding a few extra connections, the board could be made more flexible, and faster too. There were a few unexplained CompactFlash media compatibility issues, but basically the board worked OK. So enter the v2, much the same as the first board but able to work in IBM PC 5160 slot-8 use and run with DMA transfers (for up to 500KB/s in an XT). With some prototypes made, once the logic and BIOS was switched to 8-bit transfers – eliminating the latch timing issue that has plagued all the XT/IDE derivatives – things seemed to be progressing well, so well that everything was in place to start an initial ‘public beta’ of fully assembled boards. When the idea of a 3.3V CPLD was first mused on at Dangerous Prototypes – because of the lack of availability of 5V parts – some queries were raised over quite how 5V tolerant the inputs would be in reality. And it seems those fears weren’t without foundation, since steadily the prototype boards started to misbehave; they all seemed to follow the same pattern with DMA transfers going slow and then failing altogether, then memory-mapped IO failing next. For whatever reason, basic port-mapped IO seemed to survive. Stumped by this, I turned my attention to the XT-CF-lite board (now sold out, sorry! ), keen to deliver ‘something’ after all this time. And the board seems to work well – built on the 8-bit transfer mechanism and experiences with the XT-CFv2 in port-mapped mode, the board is entirely 5V 7400 series based, but critically there is no buffer on the data lines: the CompactFlash (or flash ROM) drive the data bus directly. Which got me thinking. Whilst the XT-CFv2 uses a tricky-to-solder 100-pin 72-macrocell CPLD, by eliminating all 16 CompactFlash data lines and the 8 ISA data lines, I wondered if the logic be moulded into an easier-to-handle VQ44 package CPLD? I wanted to keep DMA and Slot-8 compatibility, but memory-mapped IO turned out to be something of distraction – it’s only faster because it enables 8088 CPUs to use REP MOVSB to make a transfer, but DMA is much faster on an 8088, and the V20 (and 286+) can use REP INSW anyway. So losing memory-mapped transfers seems OK to me. In a stroke of luck, I spotted forthcoming stock of Xilinx XC9536 CPLDs in VQ44 format at Farnell – absolutely ideal for this as the simplified logic easily fits in the 36 macrocells, and the 34 IO pins are just enough. So round the prototype mill we go again, this project has turned out to be way harder and more time consuming than I was expecting 15-months back. But it’s only a hobby and it is still progressing – I’m currently awaiting delivery of the first XT-CFv3 PCBs, although the CPLDs won’t be available until the end of February. The logic is much simpler, the board will be easier to make like the Lite version. 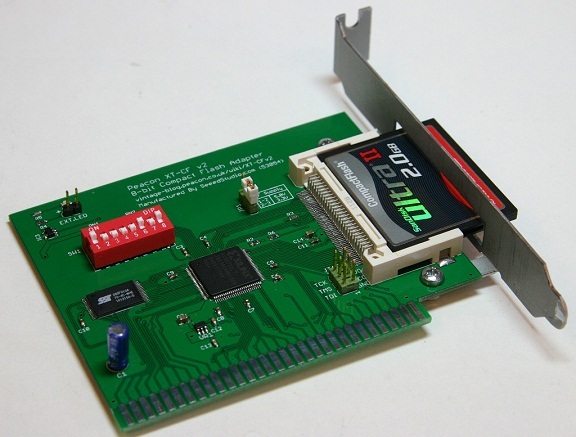 The XT-CTv2 is an 8-bit ISA card that works like a hard-card – a self contained, bootable hard disk for any PC with an ISA slot, right back to the original IBM PC 5150. It’s powered directly from the ISA slot and uses fast and cheap Compact Flash cards for storage, accessible through the custom-made ISA slot bracket, making file exchange between machines easy and without the need to open the machine. As an answer to the sea of dying MFM and RLL hard disks, vcforum members developed the original XT/IDE project in 2008 – a home-assembly IDE interface built on through-hole 7400 series logic. It was (and still is) a roaring success amongst vintage computing hobbyists, and inspired me to create the XT-CF and hence the XT-CFv2. My project goals were to build a board fast enough for Trixter’s incredible 8088-Corruption to play 30fps video on a PC/XT without re-buffering pauses, and to replace the by now themselves ageing IDE disks with smaller, cheaper and more portable compact flash (or microdrive) media. Basically, because it’s easy. Compact-flash cards can be made to behave like IDE hard drives so making possible the use of the well established XTIDE Universal BIOS, and they also support 8-bit transfers – ideal for this application. And besides, whilst compact-flash has been around for years, it’s still the media of choice for professional photography and embedded applications, so hopefully will last a while longer yet. CF cards are also cheap; 8GB cards (as big as any version of DOS can handle) can be found for under a tenner and adapters are available for those that prefer SD cards. As a development of the Dangerous Prototypes XT/IDE design, the board is based on a programmable logic (CPLD) chip, so the logic making it work is literally drawn out in software and then programmed into the CPLD chip – and this can be done over-and-over. So with an electrically sound board, thanks to the work by Dangerous Prototypes, a novice like me is free to try and re-try ideas, and hopefully eventually come up a working design. With countless hours researching, pondering, testing and tweaking – and the kind help of many vcforum members – slowly the logic and BIOS modifications have come together. XTIDE Universal BIOS project lead Tomi is very kindly adding code specific to this board under adapter type ‘Lo-tech XT-CF’. The primary goal was speed. There are several ways to transfer data in the PC, and this board offers three alternatives. For best compatibility, it defaults to 8-bit port-mapped IO that, in a PC/XT, does about 150KB/s. 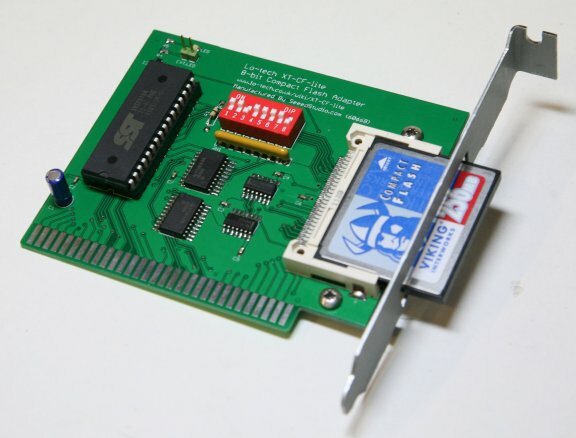 Once DOS is running, 16-bit memory-mapped IO can be enabled with a simple utility, providing 240-300KB/s – similar to the fastest 8-bit controllers in the 1980s. And for PC/AT systems, that can be improved further with reduced wait-states (to about 1MB/s, in a 12MHz 80286). With port-mapped and memory-mapped modes, the XT-CFv2 can be used in the PC/XTs ‘slot 8’, a slot usually seen as wasted because not many cards work in it, and can also co-exist with MFM or RLL drives if required. Many would-be home assemblers are unfortunately put off by the surface-mount components, but it is perfectly possible to assemble one at home with some basic tools. PCBs are available for anyone wanting the satisfaction of building their own, and the cost of components is minimal. The wiki includes assembly notes and a CPLD programming guide. Separately, I’m organising a batch of about 20 assembled boards as a kind of public Beta over the next few weeks; watch this space! After that, feedback depending hopefully things will move on to a run of about 100 boards. ATA (IDE) in most forms is a 16-bit protocol, so an IDE (or ATA/SATA) disk won’t work in an old 8-bit machine like an IBM PC/XT. 8-bit IDE cards did exist ‘back in the day’, but these worked with special 8-bit disks, and sourcing these together now will be prohibitively expensive – if you can find them in working condition that is. Enter then Andrew Lynch’s now ubiqutous XT/IDE project – a home-assembly 8-bit ISA card that enables any current IDE (or, by means of a simple adapter, compact flash, SD-card or SATA disk) to be used in an 8-bit micro. And there’s a selection of ROM images available too, so all but the earliest 5150 can boot up directly from a modern storage device. 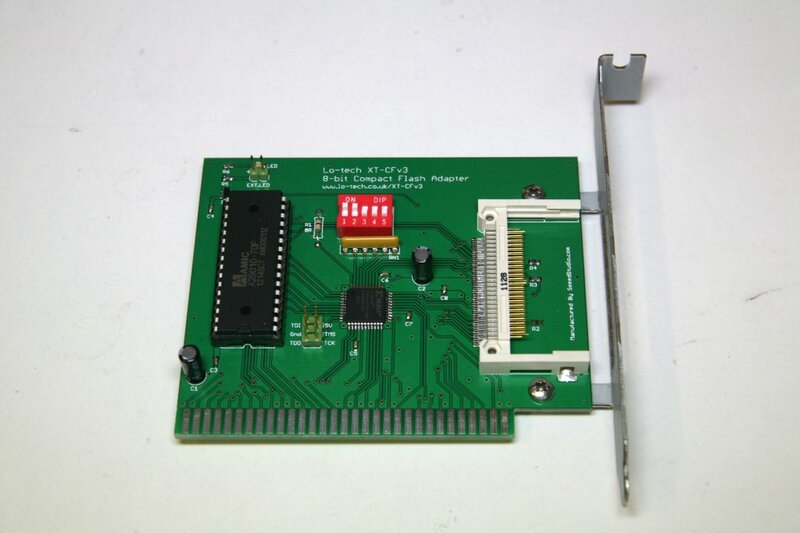 The card uses a 28C64 EEPROM for the BIOS and discrete 74LS series logic chips to divide the 16-bit data from the disk into two 8-bit bytes for the old XT bus. And, it could be built at home with just some basic soldering skills. But stock of these boards is long gone now. Ian at Dangerous Prototypes spotted more potential in the project. By using a ‘CPLD’, many or maybe even all the 74LS chips could be eliminated, instead the circuit design being implemented in software and literally uploaded into the CPLD through JTAG. In this way, the board could be made smaller and less expensive – and changes to the logic design, for example the ‘chuck-mod‘ to improve read speed, could be made without redesigning the board or cutting traces. Ians designs use mostly surface-mount components, which opens up potential for a production run of the boards, and SMT components are generally cheaper than through-hole parts – but many home assemblers will be put off. Actually assembling them isn’t too bad, with some basic equipment. So the Dangerous Prototypes XT/IDE board v1 (DPv1) was born, but after a false start with incorrect cut dimensions, the design sat on the shelf for a year. When I spotted a link on vintage-computer wiki, I just had to get involved. Ian’s first design used a 5V CPLD, but this part was discontinued (along with many 5V parts) as designers move to faster, cheaper and cooler 3.3V logic. Could the old PCs we need this to work with interface with 3.3V logic? No-one knew. With a PC/XT in my workshop and an oscilloscope I’d inhereted some years before still waiting for it’s first project, this seemed like a great chance to learn how to use that and hopefully get this moving. By adding some test points to an original XT/IDE board, the signals in the PC/XT could easily be analysed – and some were already near 3.3V it transpired. In any case, 3.3V logic levels have been designed to be compatible with 5V TTL. After some discussion with Ian, he thought it was worth a shot. As it happens, much later it transpired that ATA-6 disks (c.2001 and newer) themselves use 3.3V singalling too. But either way, the boards worked! A couple of drive compatibility problems were resolved by changing the cable-select termination (actually, a minor deviaton from the ATA spec inherited from the original XT/IDE board) and with that fixed, we just couldn’t break it – every computer and drive we tried worked. Pietja produced CPLD code for both the original circuit design and the ‘chuck-mod’ version, which with the appropriate BIOS all worked just fine. Performance wise of course it’s identical to the original board, throughput in a PC/XT with the Chuck-Mod being about 115KB/s write and 230KB/s read. It easily out-performs the original ST506 and indeed later RLL drives like the ST-251. So with the board proven, the missing traces in the V1a design were corrected and a small run of V1b boards produced. Although still with the CSEL problem, this is easy to correct at assembly by jumpering pin 28 to pin 30 on the underside of the header. With that change, the board is reasonably cheap, easy to assemble and works perfectly. I have a few of these available to buy right now – see the bottom of the page. With so few components it’s cheap to make – by far the most expensive part being the 28C64 EEPROM. After a bit of CPLD development, Pietja again came up with the goods and produced a working port of the original XT/IDE circuit logic for the board. With it, his board came to life with no problems found in initial testing. The original XT/IDE – through-hole but not currently available. I’ve put some parts lists up on the wiki here and some notes on SMT soldering. 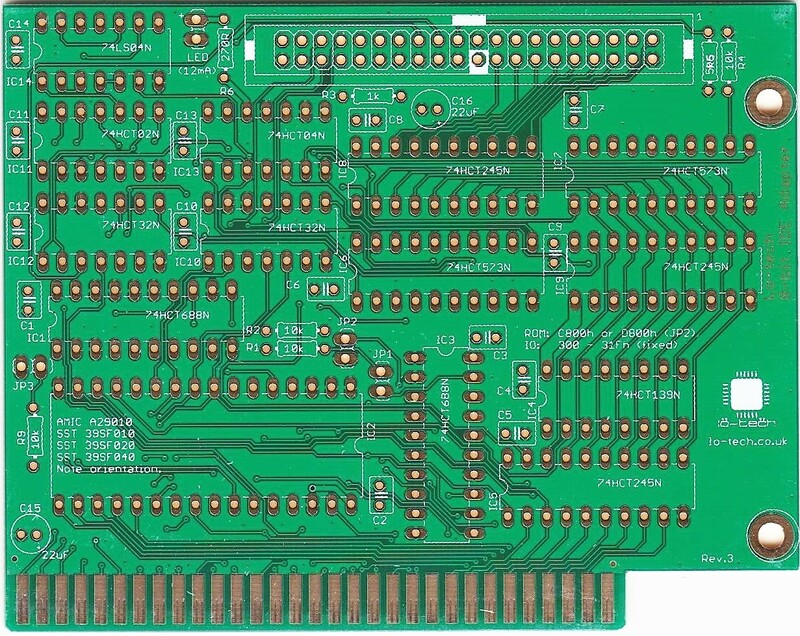 Whilst this was all happening, the creators of the original XT/IDE board have produced a Version 2, which adds some very cool capabailities based around booting from disk images via a serial lead, but it seems the boards made have now all been sold. It was also quite expensive to make, especially with the high-speed serial UART. Assembled DPv1b Boards Available Now! Please see the vintage-computer forums for sale section – I’m making available two v1b boards and my original prototype v1a too. All three are fully tested, although the prototype is physically fragile. Proceeds will be fed straight back into the development of the compact flash board I’m currently working on. Note: The Keystone 9202 ISA bracket is not included, since stock in the UK is non-existant. These can be obtained from DigiKey in the US.